Apparently, I never claimed this blog on Technorati... Just entering my claim code. CWBMTJHU8FBK . Maggie and I went to a really special place today, and I took a BUNCH of pictures. Too many for one day! So today, I'll just tell you about Nordhouse Dunes. For starters, just getting there is peaceful. The road you drive in on is 6.5 miles long, with only a few short deadend roads to private cottages off it. You can see that it's just right to put you in the right mood for a quiet place. Nordhouse Dunes is the Lower Peninsula's only designated Wilderness. That means that it's managed by the U.S. Forest Service, and that there are some specific rules about how it's managed. There is no timber harvesting or mineral extraction allowed. In fact, no power tools can be used there, and no wheeled vehicles are allowed (that includes bikes, canoe dollies, etc). 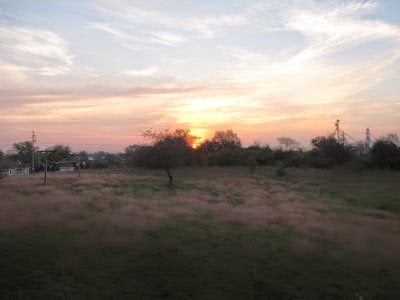 The area consists mostly of dunes, both forested and open. Most of the trails are in the woods, but a couple are over open dunes, and I took one today. On the entire west side is Lake Michigan. Once you hike about a mile west from the parking lot, you can follow dunes and ridges for miles with the big Lake always in view. If you are thinking that you've heard the words "Nordhouse" and "Lake" together before, you are right. There's a small inland lake on the east side of the Wilderness. I went by there twice this spring. I'll link to those posts at the end. If you head down to the beach, it's... well... Lake Michigan! Miles of white sand. You can see the city of Manistee in the distance in this one. Even Maggie pretended to like the water for a few minutes. Well, she wanted a drink, so she had to at least get her feet wet! OK, I can't leave without a little, itty-bitty, smidgen of magic. We are finally seeing a tiny bit of color in the trees. I don't think it's going to be a great color year, but that means I'll just have to look harder for the special treats! Supposed to turn cold and rain through the weekend. I'm so glad that Maggie and I took a good walk today! On Sunday afternoon Maggie and I went hunting for a new adventure. The weather was beautiful, and I had recently heard about a park in the county that I didn't know anything about. Of course that had to be remedied! So, off we headed for Wilson Hill Park. It's on the east side of Hamlin Lake, and I'll be adding it to my Get Off The Couch web site soon. But when we got there, alas! Every space was guarded by signs that said, "No Dogs Allowed in Park." I ask you, what kind of park is that? Maggie added many protests of her own as I quickly jogged around taking some pictures for the web site. Then we headed off to another park, not too far from the first one, where dogs are very welcome. Even better, there was no one there at all, and there is a trail of about a mile to walk. That's where we saw the Orange Kist cooler. 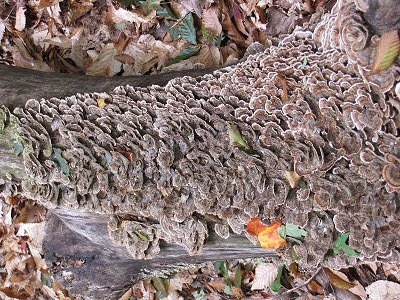 We also saw this log, totally covered with a polypore fungus called "Turkeytail." This group has covered a log so completely that it's hard to tell what it looks like until you get closer. This one almost looks like an autumn rose! I think I like this one best. 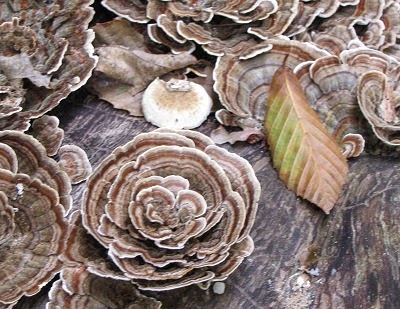 I can't decide if it looks more like a turkey tail, or fresh shavings from an old-fashioned pencil sharpener that peels off those long strips. I had been thinking about doing a post about orange things, and this sight just pushed it right over the edge... as soon as I finished laughing. Just in case someone doesn't recognize this, it's an antique soda machine, inexplicably dumped in the woods. A few steps farther along I found this cinnamon fern, looking... very cinnamony. This is one of the orange images that I already had. This is devil hawkweed if you live in the Midwest. I grew up calling it Indian paintbrush. At any rate, it's Hieracium aurantiacum. Finally, here is one more shot of a monarch butterfly. I finally caught one with its wings open! All right! This is the first contest since April, and that one didn't have many entries. Before we start up again, let me type a few words about my philosophy of the contests. I want them to be fun, but they can't be so easy that everyone will get everything right, or there won't be a winner. And, although you might have to spend more than five minutes on them, there is a tangible prize... a do follow link with your 125x125 avatar for a month. I hear a lot of people saying they don't enter because they are afraid they won't get them all right. Hey! This isn't school! I won't embarrass people (I hope). Just play, and have fun- maybe you'll win. Send entries to jhy@t-one.net before midnight Eastern Daylight Time, October 1, 2010. That gives you 5 days and a few hours. Ready? Here we go! 1. Tell me where the insect is in this picture, and what kind it is. If you need a clue as to what you are looking for, see A Fairy Tale in Green and White. For 2-7, follow these directions. Visit each of the blog posts below. They were chosen from recent top commenter's blogs, in no particular order. In each post look for one of the six bright rainbow colors in the text. Then, write down the name of the person who writes the blog, the color, and the item which is described as having the color. At rainfield's blog, read A Desperate Fantail. Look for a color- You will find black in the example, but it's not a rainbow color, so it won't be one of the ones in the actual contest. The sentence is "It flew away, only leaving the post and landed on the nearby black bin." Then grab the word the color describes, which is "bin." 4. At Jean's blog, read European Starlings in the U.S.
8. Tiebreaker- take the 6 words, with or without their colors, and the name of the insect from question 1, and write a short essay using all of them. If the word has more than one meaning, feel free to use any meaning or nuance. Create! Again, send entries to jhy@t-one.net before midnight Eastern Daylight Time, October 1, 2010. Meet Jeremiah, the third dog of my life, but the first that I owned as an adult, and had full responsibility for. He was a gift from Om's boss, on our first Christmas together, in 1968. His nickname was "Germ." We lived in married student housing, and many of the others had children. They loved having a little furry puppy to play with. It was very difficult for the kids to understand why they shouldn't play in the street, since it was a little-traveled gravel road. But one day, they were all playing in the road, and a car clipped Jeremiah. He wasn't even a year old. He mostly had a head injury. Just as it's not a good sign when this happens to humans, it wasn't great for a dog, either. He did recover, but he was never quite the same. The children really understood about the road after that! The next trauma was one of the more bizarre stories of my life. We were getting ready to move to Michigan, in the fall of 1969. We were doing errands in Marion, Indiana, about 30 miles from where we lived. We were on the sidewalk, and a larger dog came out of nowhere and they started fighting. Jeremiah was losing, and he ran away. We hunted and hunted, but could not find him. We knew he was hurt, there was blood on the sidewalk. We had to move to Michigan without him. A friend from Indiana kept hunting for him. I was crushed, with the intensity of the young. I prayed and prayed for that dog, as if he were a human. And, in what still seems miraculous to me, a full month later, our friend Harold found him hiding in an abandoned basement. 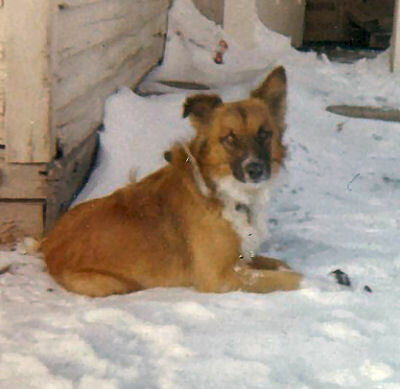 He was thin, frightened, and his coat was matted with partially healed wounds. Harold made the six-hour drive to bring Jeremiah to us. 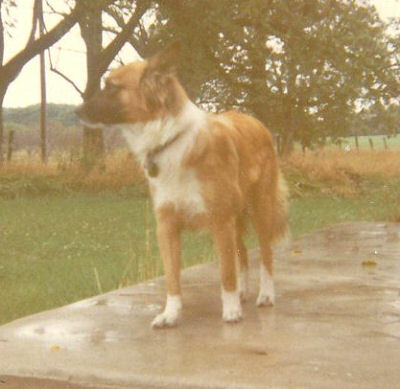 Here he is, at the first place we lived in Michigan. He looks fine, but he was always strange after this. He was fine with us, but would get spacey from time to time. Not exactly a seizure, but something not quite right. This is just a nice shot of him. Here's one of the last pictures. He's wearing jingle bells on his collar for Christmas. 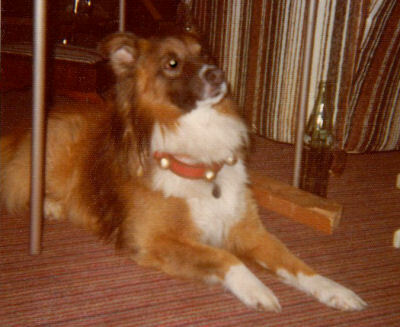 Talking about past dogs is always going to be sad in the end, because "past" means that they have all died. Yet, this death was surrounded with more angst than others. I had to choose to have him put to sleep. After we adopted Steve, it became apparent that Jeremiah was not going to be able to adapt to having a baby around. He actually bit baby Steve in the face, and that was the wake-up call. My head knew that there was no other choice between the baby and the dog. 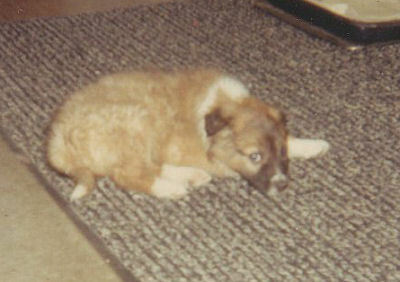 My heart couldn't understand why I had to choose to surrender the dog that had been almost miraculously given back to me. I'm not sure I have this identified quite correctly. The vetches are really tricky, and there are quite a few of them. But of the four that I've found in my field, the white one is least often found. Even though it's white, I'm pretty sure it's not Canadian Milk Vetch, Astragalus canadensis. I used to think that it was just a color variation of this Hairy Vetch, Vicia villosa, or the Cow Vetch, Vicia cracca, which is really similar, but all purple. But I'm not sure if it's really a different plant. The leaves are rounder than the others, too. All three of these that I've just mentioned are good cover crops (they are legumes, so they put nitrogen back into the soil), and they are good food for cows. But they are not good at all for humans, and other mammals with one stomach compartment, to eat. They contain cyanide. A couple of seeds won't kill you, but a large quantity could. In other words.... these are not a wild edible that you should gather! Just a couple of "housekeeping" notes. First of all, I'm bringing back the monthly contest. I was sorry to let it go this summer, but there just wasn't time, with all the hiking. So... I'll keep trying to make up contests that aren't so hard you won't play, and are also fun. So, get ready! For new readers, this will be some silly little game. Anyone who plays will get a text link in the answer post, and the winner will get a banner ad for a month in the sidebar. I also need to update the monthly commenters ads, because some of you who are now faithful visitors are not getting any recognition. So, stay tuned! I want to thank both my SIL Loretta, and Russ of Grampy's World, for linking to my blog lately. Nothing too fancy or unusual today, just a common and pretty autumn flower. This is Calico Aster, Aster lateriflorum. I see that the asters are being renamed with all the new taxonomy changes, so if you care, it's also Symphyotrichum lateriflorum. Right. Anyway, it is a weedy-looking wildflower, just because the flowers are small, and the habit is spreading. But it's dainty, too. The "calico" name comes from the fact that the yellow flower centers fade to purple as they age. Can you see that there is a visitor? Hey! It's a honeybee! I'm really happy to see this, since they have been having such a difficult time in recent years. This is a variation of Kitchenhenge, but today, the first day of fall, has something else really interesting going on. It's called a Super Harvest Moon, when the full moon of September also falls on the Autumnal Equinox. It hasn't happened since Sept 23, 1991, and won't occur again until 2029! 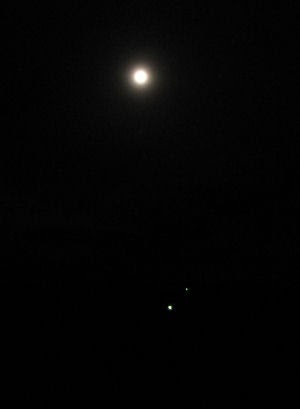 As if that wasn't enough, there is a rare conjuction of the planet Jupiter with the moon. I'm not set up for night photography, at all. But I went to those kitchen steps. The time was 94 minutes before the official equinox. If I had remembered I would have tried to get an earlier picture with the big orange moon. But then I would have missed Jupiter. It's the brighter of the two dots below the moon. I have no idea what other star the camera picked up. But I'm just happy to have caught these two events. Om was busy this afternoon, so Loretta and I were looking for something fun to do. But it was really windy, so some outdoor activities didn't appeal quite as much as usual. We were in the drugstore, and picked up a brand new flyer for a self-driving tour of Centennial Farms in the county. In Michigan, Centennial Farms are ones that have been in the same family for 100 years, who choose to register with the Michigan Historical Commission. The leaves haven't even started to turn- no color there! But I did manage to provide some lovely fall color in the form of fields full of pumpkins. I liked this one with the church peeking over the hill. This tour took us past 25 of the more than 50 registered farms in the county. Frankly, a lot of them weren't very interesting. Remember, this isn't necessarily the oldest barns, or the most interesting. Many of these farms are still in operation, but some were simply still in the family with most of the old buildings gone. Nevertheless, here are a few pictures from our tour. This one wasn't so well kept up, but it was interesting, and I'm always attracted to old barns. This one is very much in active use. It's on a major highway, so I often pass by here. But many of these were well out of the way. It was a fun way to spend the afternoon. Loretta is here for a few days. (Tomorrow I'll probably do some family pics), but today we went for a walk at Ludington State Park. As we were crossing the boardwalk at the edge of Lost Lake, I noticed these spiral submerged plants. The pictures are fuzzy and dark because the plant is completely under the water surface. Now, this really bugs me, because this is my area of expertise, wetland plants. But I don't know what this is! And, I haven't been able to find it. As you can see the stem is tightly spiraled, and the plant is growing completely underwater. The water here was about a foot deep. I went looking for cultivars that might have escaped, or new invasives that I haven't heard of. The only two tightly corkscrewed aquatic plants that I could find are Variegated Corkscrew Rush, Juncus effusus, "Frenzy," or Corkscrew Rush, Juncus decipiens. I couldn't find where either of these will grow completely submerged. But then I realized that this plant is probably not a rush. Can you see the funny thickened end of each stalk? It's a straight extension of the curly part. I've never known any rush that grows like that. Finally, look at what is on the end of each of those extensions, There is a little three-petaled flower. One of them is blooming underwater, and the other has just broken the surface. So this can't be a Juncus at all. They don't flower that way. This is some actual flowering plant. I may have to email the park naturalist. Update: 2011- This is Vallisneria spiralis, spiral vallis, or eelgrass. The leaves are tapelike, but the flower stalk grows in this tight spiral with the small three-petaled flower on the end. Just one picture today. That's because it took me most of an hour to figure out how to label this cute little orange guy. I'm pretty sure this is a silvery checkerspot, Chlosyne nycteis. It's a butterfly that is one of the Brush-footed butterflies. The size is a little over an inch across. I was about 10 feet away, and got this with the telephoto, so I didn't get to see any detail except what I can see in the picture. It was flitting around the field. Note: August 27, 2011- This is NOT a checkerspot. It is a Northern Crescent, Phyciodes cocyta, which are also found in Michigan. I'm no butterfly expert, and I thought this was a skipper. So I looked in my (not so good) butterfly book, with no good results. I looked on line. Finally I was reduced to finding a list of all 45 skippers in Michigan and looking for their pictures. No luck. So I switched to looking at other Michigan butterflies. It's the same color as some fritillaries, so I looked at 12 of them. Close, but no cigar! So I just kept going down the list and this is the best match. It says they like open meadows, roadsides, and lake edges. Yup!